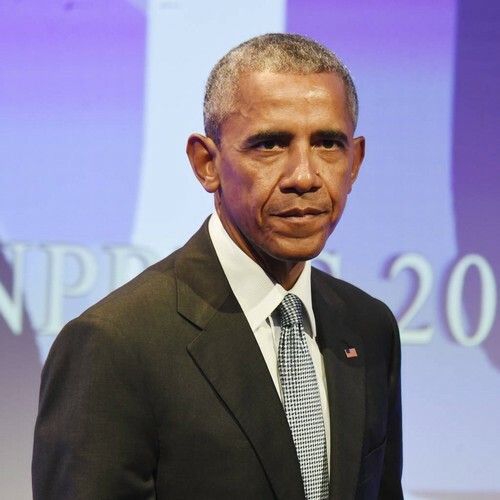 Former U.S. President Barack Obama has honoured Nipsey Hussle in a letter read out at the slain rapper's Los Angeles memorial. Thousands of fans packed into the city's Staples Center on Thursday (11Apr19) to pay their respects to the Last Time That I Checc'd star, who was murdered outside his Los Angeles clothing store on 31 March (19). The ceremony, which got underway almost an hour later than scheduled, began with a few words from religious leaders, before photos of the MC through the years were shown on the big screen to the sounds of Frank Sinatra's My Way. Among the images were a number of Nipsey with his family, including his longtime girlfriend, Lauren London, and their two-year-old son Kross, and his daughter Emani, from a previous relationship. Singer Marsha Ambrosius then stepped up to the microphone to deliver a powerful rendition of Fly Like a Bird, taking a few deep breaths before the performance. "Let's go fellas, this is for Nipsey," she said to her backing band. Pastor Shep Crawford delivered a prayer in the 33 year old's memory, while hip-hop media personality Karen Civil read out a personal letter written by President Obama that morning. In the note, he explained he learned of Nipsey's music through his two daughters, and began reading up on the rapper's philanthropy and activism shortly after his untimely passing. "He saw potential, he saw hope" in his native Crenshaw, Obama observed, adding, "He set an example for young people to follow and is a legacy worthy of celebration." "Michelle and I send our sympathies to Lauren, Emani, Kross, and all his family, and to all those who love Nipsey," he concluded. The ongoing memorial, which is expected to last two hours, also featured a lengthy tribute from Nation of Islam leader Louis Farrakhan, and a song from Anthony Hamilton, while Snoop Dogg is also due to deliver a few words, with Jhene Aiko and Stevie Wonder set to perform.